Dr. Kitt earned her DVM in the West Indies at, coincidentally, the Ross University School of Veterinary Medicine in St. Kitts! Her 12 year old dog Demetri is from St. Kitts. Sadly, 15 year old Chica, another St.Kitts dog, passed away recently. Dr. Kitt sees a new guinea pig in her future if her kids get their way! When not at the hospital, Dr. Kitt enjoys spending time with her husband and two daughters (6 ½ years old and 14 months of age). “We love to go to the Zoo and Safari Park,” she says. “Spending time with my family is so important to me and it keeps us quite busy!” Dr. Kitt’s experience working with FACE has been rewarding. 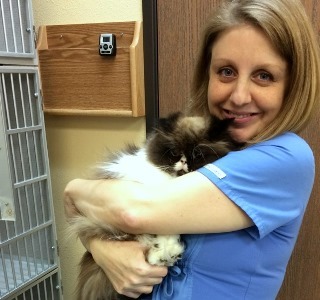 “It was so refreshing being able to heal and care for these beloved pets in a situation where euthanasia was likely the next option,” she says. Would she recommend other hospitals work with FACE? “Yes! Because they help give second chances! There is nothing quite like knowing you saved a life! FACE helps make that happen.” FACE thanks Dr. Kitt Mueller and her colleagues at Mohnacky Animal Hospital for helping us make these second chances a reality!